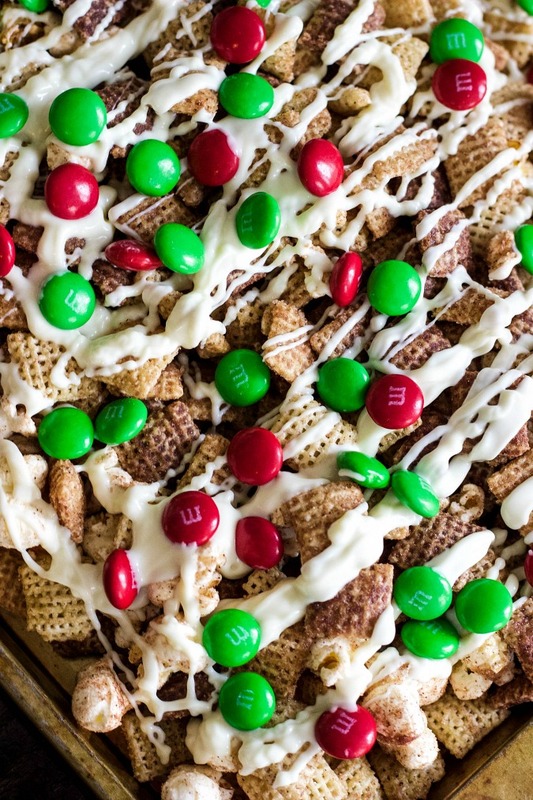 An easy and delicious Chex Mix recipe that combines cinnamon and white chocolate for the ultimate treat! This past weekend I was finally able to take a break and have some fun in the kitchen. I started a new job recently so I feel like I never have time for anything beyond the basics. For me, that means keeping the kids fed and my house in a semi-decent state. Since I do the bulk of my Christmas shopping online, I’ve been receiving packages more frequently than normal. 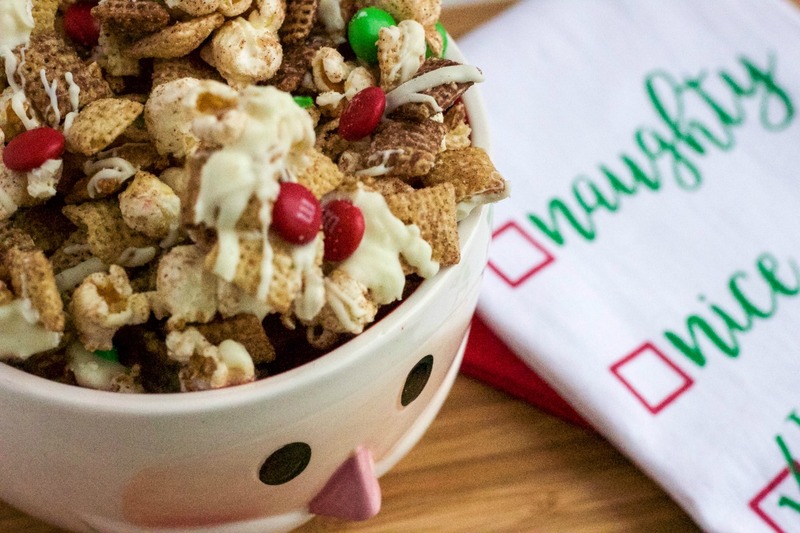 One of them was a fun gift from the folks at General Mills Cereals that included most of the ingredients that I used in today’s recipe along with a special spatula with my blog’s name on it. How cool is that?! Side Note: It’s funny how my older kids try to decipher what’s in each package based on the size and weight. They act like they no longer care about gifts, but their actions say otherwise! 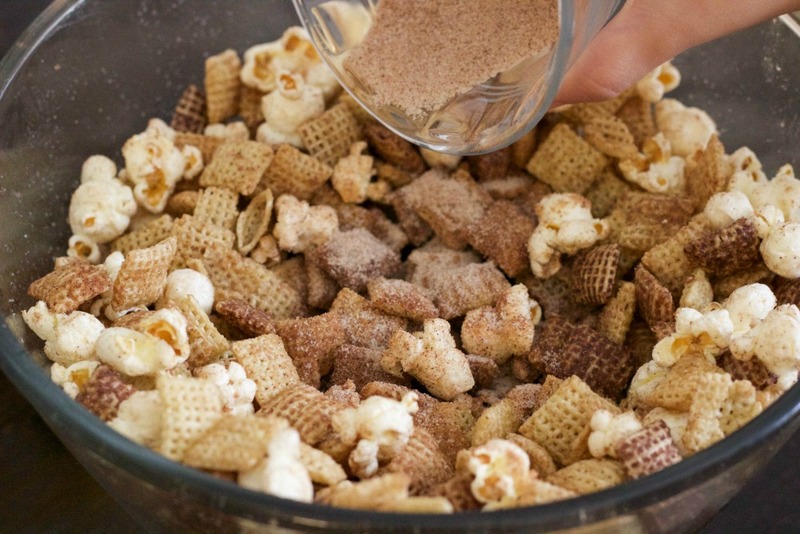 This Chex Mix treat is adapted from this Snickerdoodle Chex Mix recipe. The recipe is delicious as is, but I decided to add my own little spin to it. It’s an easy recipe so it’s perfect for little ones that want to help out in the kitchen. I had my five-year-old help me pour the cinnamon and sugar which made her feel like she was doing a “big girl” task. The combination of Cinnamon Chex and Chocolate Chex cereals with popcorn makes this the perfect crunchy snack for family movie night. 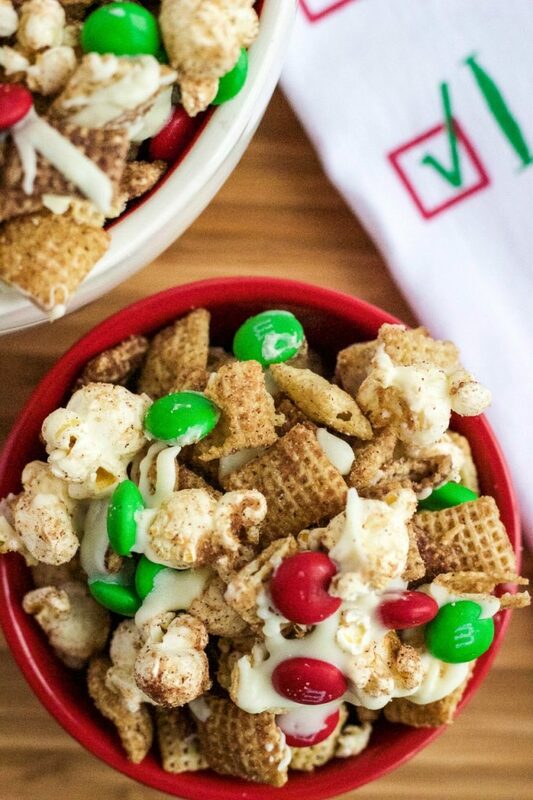 In fact, this past weekend we kicked things off with How the Grinch Stole Christmas and Christmas with the Kranks while enjoying this fun snack. If you want all of the Chex Mix to be coated in white chocolate, simply keep it in the bowl and stir in the melted chocolate until it’s coated well. I prefer to drizzle the chocolate while the Chex Mix is on the cookie sheet. 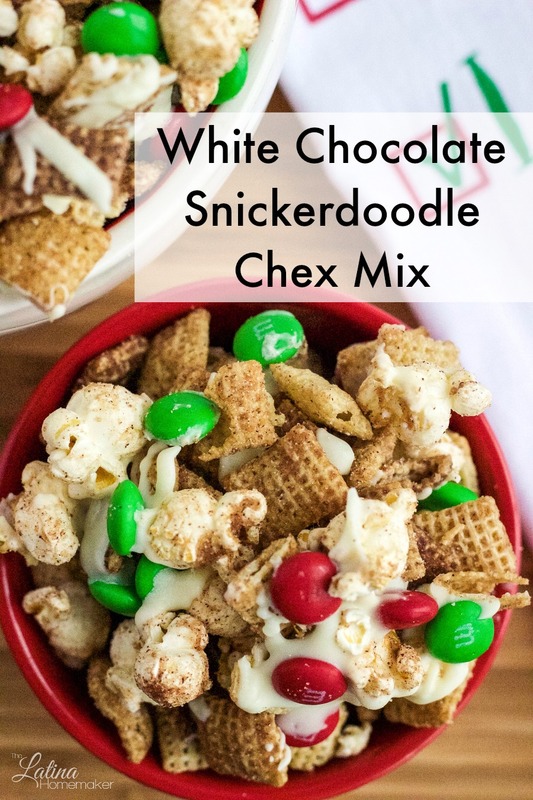 This will yield a delicious combination of chocolate Chex Mix clusters as well as cinnamon sugar coated Chex Mix. Basically the best of both worlds! I love that this delicious treat also makes a fun and tasty Christmas food gift. 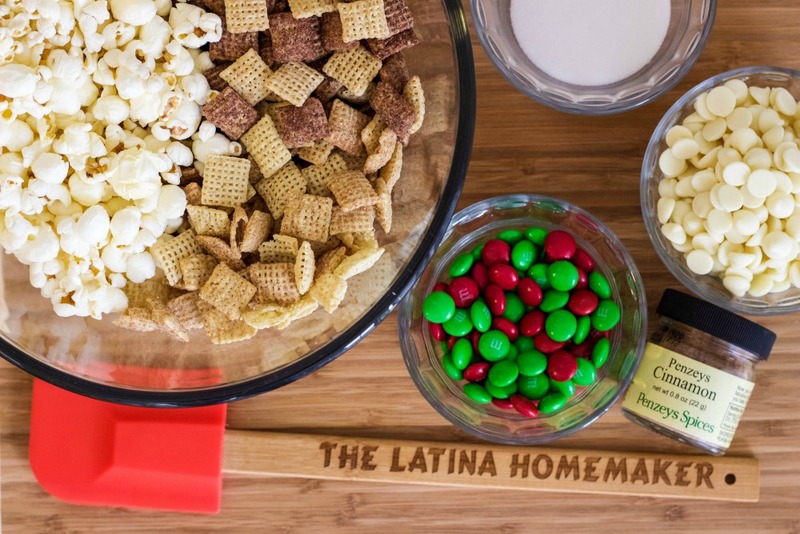 What are some of your favorite Chex Mix recipes? In small bowl, mix sugar and cinnamon, set aside. In large microwavable bowl, mix cereal and popcorn. Melt butter and pour over cereal/popcorn mixture. Stir until evenly coated. Microwave the cereal/popcorn mix for 1 minute. Sprinkle half the sugar and cinnamon mixture, stir. Sprinkle the remaining sugar mixture and stir again. Microwave for an additional minute. Spread over cookie sheet or waxed paper to cool. Melt white chocolate chips in microwave. Start at 10-15 second increments until chocolate melts. 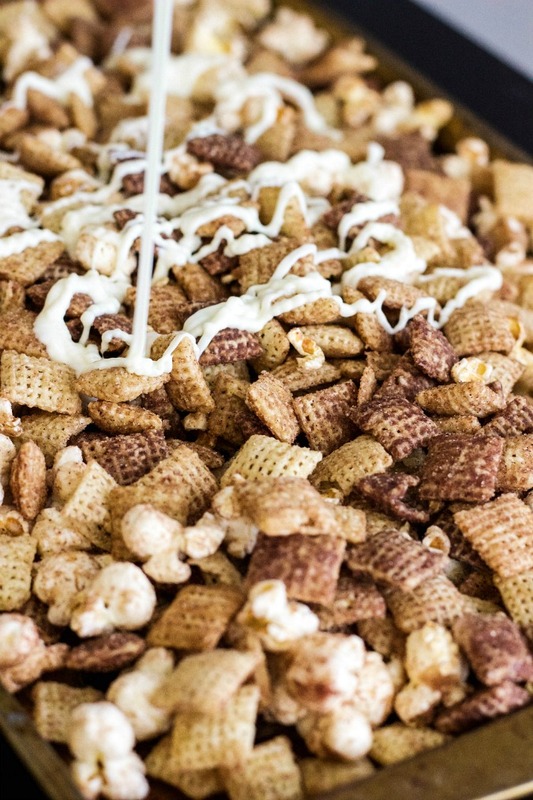 Drizzle white chocolate over Chex Mix. You can either mix it in a bowl to coat it well, or allow it to set on the cookie sheet. Add chocolate candies of your choice. Enjoy! 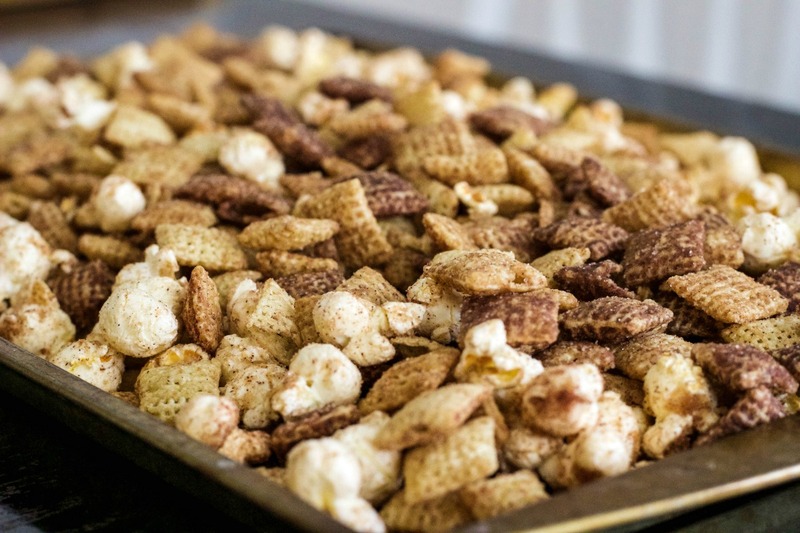 Once white chocolate sets, break up the larger pieces and place the Chex Mix in an airtight container.